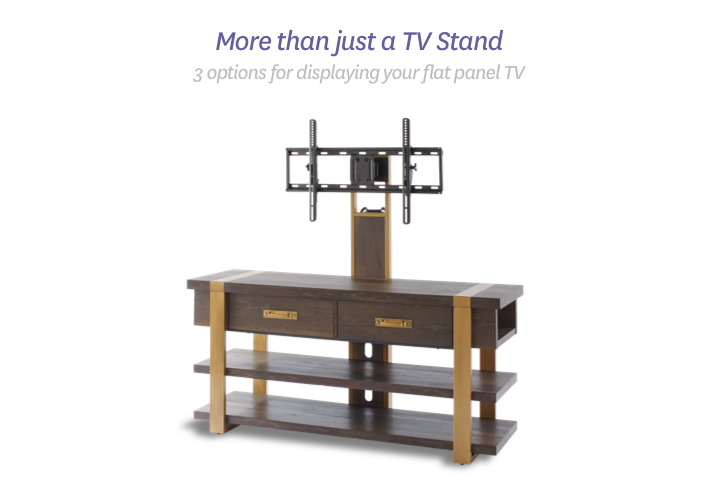 The Lana Modern 3-in-1 TV Stand provides 3 ways to display your flat panel TV. First, mount your TV on the included floater mount to allow TV to swivel and tilt without having to attach it to the wall. The included tilting wall mount can be used to mount the TV directly on the wall if preferred. Additionally, you can use your console as a table top display. Two large open shelves provide ample space for set up of A/V equipment and components while the 2 large drawers are ideal for storing media and accessories. Convenient side cubbies could also be used to store small items like remotes. Stylistically the console design is up to the task as well. A sturdy steel frame and and laminate construction is finished in deep tones of a toasted brown ash. The console top features gold metal straps that complement the rustic wood finish. Add other items from the Better Homes and Gardens Lana Modern Collection to complete your entertainment center, family room or den.